Angry liberal women organized a national protest today to walk off their jobs and refuse to shop because of Trump. 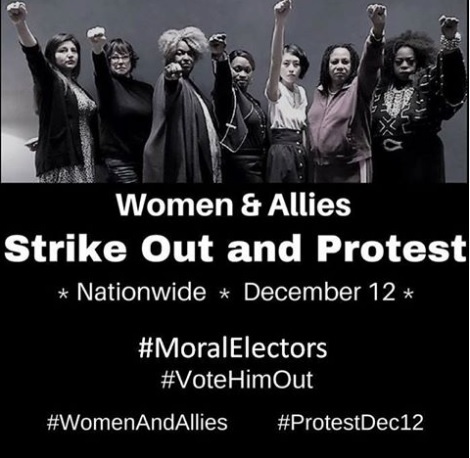 The women are going to walk off their jobs and march to Trump Tower. The feminists will then protest in front of Trump Tower until 8 PM. Here’s hoping they all lose their jobs. —And, Trump supporters, make sure you go out and shop today! 12:30- Eve Ensler will speak. 01:00- Spoken Word Poetry by Gina Loring, Aja Monet, and Jaha Zainabu. Get pumped- Sign up for our email list to get informed on other events, petitions, and actions our group will be doing in the future. Everybody is invited to come, even if you aren’t able to march, we’ll be speaking about the upcoming administration and what we can all do to keep our rights. 2 pm- We will march to Trump Tower on 57th & 5th Ave. While chanting, and speaking out will end at 8 pm, participants are invited to stay longer into the night. ALSO: If you have the APP SNAPCHAT, we have a special filter for participants to use, on 5th Avenue, between 57th and 59th. This filter will be available between 12-noon and 9 pm. It has the “Women and Allies” Protest filter so you can take pictures showing your support, and you can send it to friends and family! Please know that we have some helpers that will be making sure everybody keeps safe and is not wrongfully arrested. Our own volunteers will be available for you to contact if you need-Those in NEON GREEN/YELLOW vests will be there to help report any violence you may see- we are a PEACEFUL protest, and we stress that everybody here please respect that. Those wearing Neon Green/Yellow vests will also be there to help alert us if people are getting arrested wrongfully. The National Lawyers’ Guild- NYC Chapter has agreed to recruit volunteers from their members to serve as Legal Observers at our march. They will be deployed throughout the day in waves and will be wearing NEON GREEN BASEBALL CAPS. ORANGE VESTS will be available to go to if anybody is injured. They will contact us at the front, and we will get NYPD (who has been incredibly helpful with this,) on it to make sure we have people sent to you to make sure you are okay! Remember there may be a chance of rain or snow, so please dress appropriately! It’s cold outside, but that will NOT stop us! And PREPARE for the ALL DAY SPENDING BOYCOTT! If you are participating, bring water, snacks, basic first aid for yourself, and anything you may need while protesting if you can. Clean up will happen after the majority of people have left.